Events by RadoSt began their year in grand style – with sparkling wines in The Grand Hotel Union's stunning main hall. 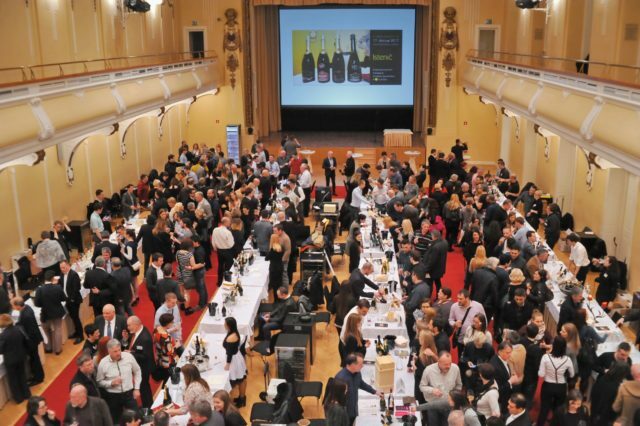 On 17th of February, Union hosted more than 600 visitors, who had the opportunity to taste various sparkling wines among with culinary delights prepared by hotel chefs. The main mission of the event remains faithful to its aim, concern to raise the culture of wine drinking through education. Among with wine tasting, two workshops for its visitors were prepared: three best-rated sparkling wines were presented at the Sparkling meeting of Croatia and Slovenia workshop and Pink Bubbles, workshop intended for the youth, led by young winemakers. The chief aim of the event was to grade sparkling wines. Two seven-member commission have evaluated 99 samples and recognition award was bestow to the highest estimated sparkling wines. The best of its all waited until the end. The partners of the Sparkling Wine project, Union Hotels (Hotel Lev, Central Hotel, Grand Hotel Union and Grand Hotel Union Business) and Hotel Cubo selected sparkling wines for their wine selection among all the evaluated wines. As Grand Hotel Union announced, they are pleased to walk hand in hand with the Salon of Sparkling Wines for a higher level of wine culture. They have also selected two winning sparkling wines, which they have received a guaranteed purchase of their wines for Union Hotels.